My passion is to improve the quality of life of my patients by offering them evidence-based treatment choices to better manage their pain and functional limitations. Dr. Zaffer is fellowship trained and board certified in physical medicine and rehabilitation by the American Board of Physical Medicine and Rehabilitation and in electromyography by the American Board of Neuromuscular and Electrodiagnostic Medicine. A physiatrist with more than 16 years of pain management and rehabilitation experience, Dr. Zaffer utilizes his extensive knowledge to educate patients about the options available, including treatment with non-surgical and interventional pain techniques. Prior to joining Florida Orthopaedic Institute, Dr. Zaffer was the medical director of a private practice in outpatient physical medicine and rehabilitation as well as in electrodiagnostic medicine. He has focused on treating patients with physiatric conditions for over 12 years. As an expert in the field of pain medicine, Dr. Zaffer was a guest lecturer at Indiana University, speaking on topics pertaining to Physical Medicine techniques and treatment for rehabilitation patients. Dr. Zaffer has authored articles in the American Journal of Physical Medicine and the Clinical Journal of Sports Medicine, along with clinical research studies in neuropathy and sclerosis. 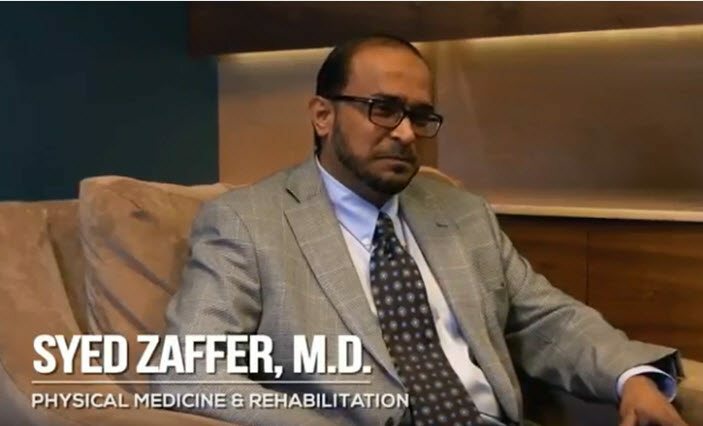 Dr. Zaffer studied medicine at Osmania University in India and pursued his passion for physical medicine and rehabilitation at Indiana University. He taught at Loyola University Medical Center in the Department of Orthopaedic Surgery and Rehabilitation. Dr. Zaffer is a member of the American Academy of Neuromuscular & Electrodiagnostic Medicine, the American Academy of Physical Medicine and Rehabilitation, and the American Society of Bariatric Physicians. In his free time, Dr. Zaffer enjoys spending time with his family, hiking and reading. Dr. Zaffer is a great doctor. He takes his time and answers all questions we might have. So far, there has not been much of a wait time to be seen. We are usually in and out within an hour. A blessing to have Dr. Zaffer as part of my team of doctors at Florida Orthopaedic Institute for the last two years. Thanks! Doctor Zaffer is the best! If I could give him six stars, I would! I was courteously greeted when I entered the office and was seen shortly after arrival at each visit which made me feel that my time was valuable. Dr. Zaffer LISTENED to me and explored my issue. He worked WITH me to determine my plan of care. My pain is finally under control because of our TEAM effort. This practice should be a model for other offices! Thank you!